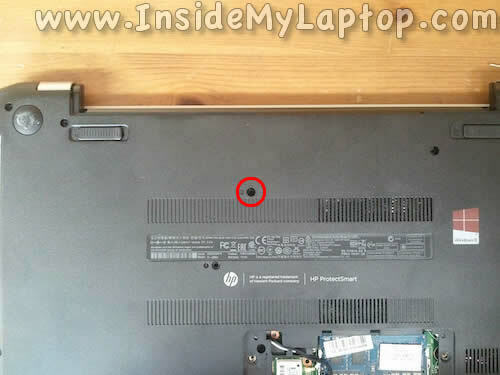 In this guide I explain how to disassemble a HP Pavilion TouchSmart 15. 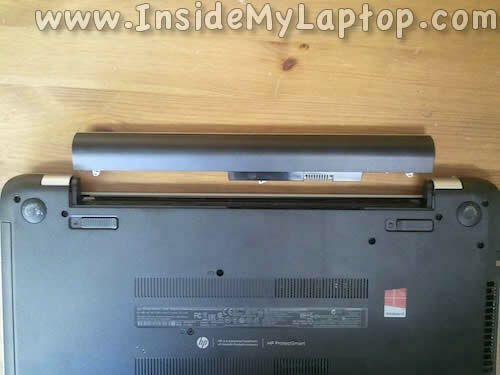 For this example I’m taking apart a HP Pavilion 15-n280us model. 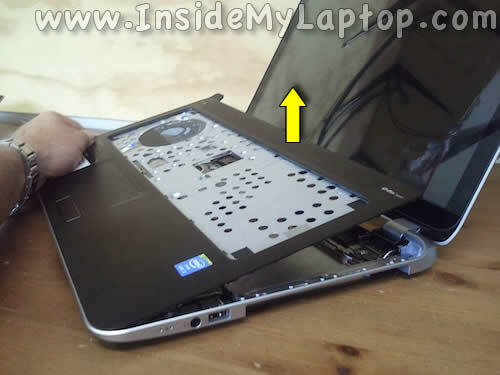 Make sure the notebook is turned off before the disassembly process. 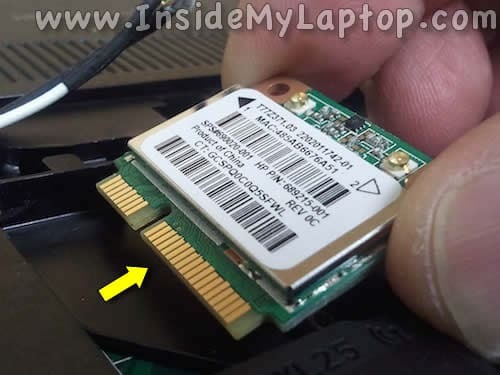 Loosen two screws securing the RAM/wireless card cover. Using a plastic stick pry the cover out and remove it. 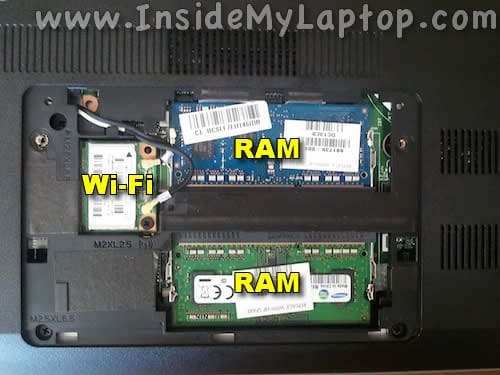 Under the cover you can access both RAM modules and wireless card. We’ll be removing the wireless card and one of the RAM modules after step 27 in order to remove the motherboard. 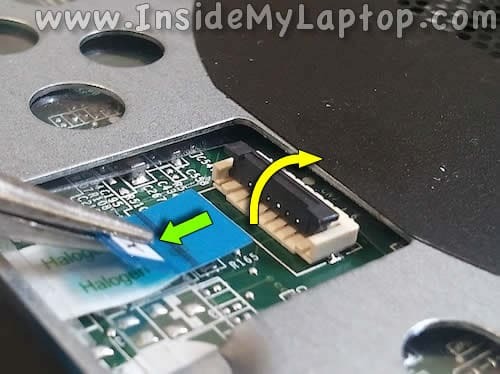 I had some trouble removing the optical drive from the case so I used the following technique. 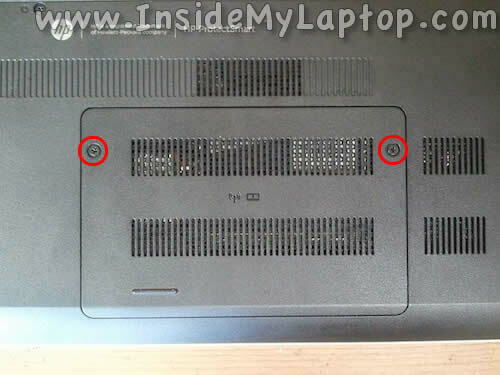 Using a small screwdriver push the optical drive out through the screw hole. The drive will move to the left a little bit. 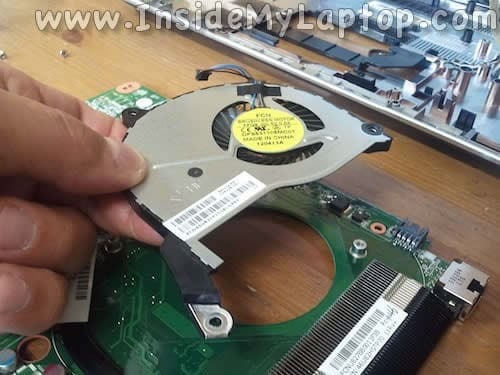 Now you can pull the optical drive out and remove it. 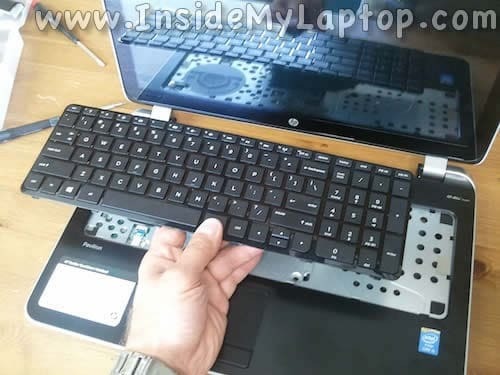 To remove the keyboard do the following. Place the notebook on its side. 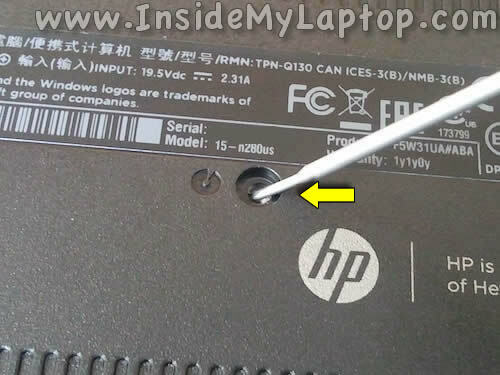 Push on the back side of the keyboard with a small screwdriver thought the screw hole. 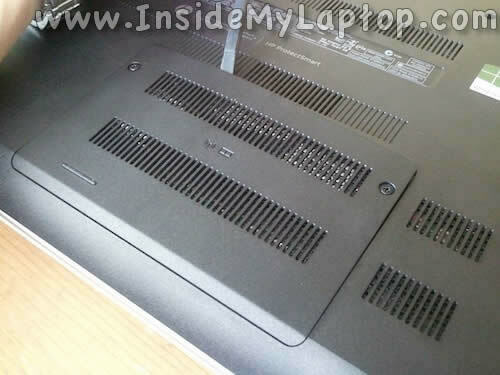 While pushing on the back, you will see the front side separated from the top cover a little bit. 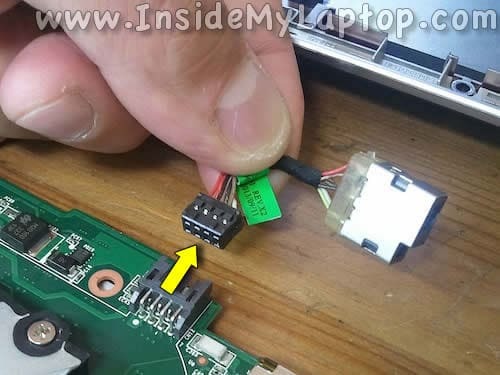 Now you can access the cable and disconnect it from the motherboard. 1. 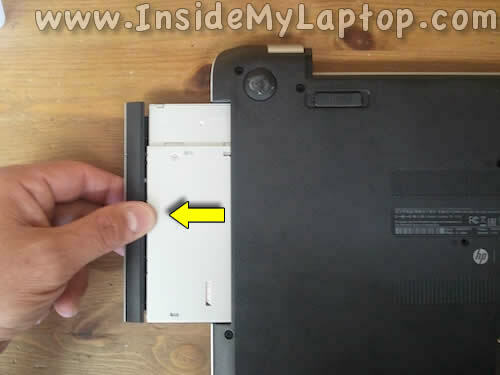 Lift up the retaining tab – white piece in my example (yellow arrow). 2. 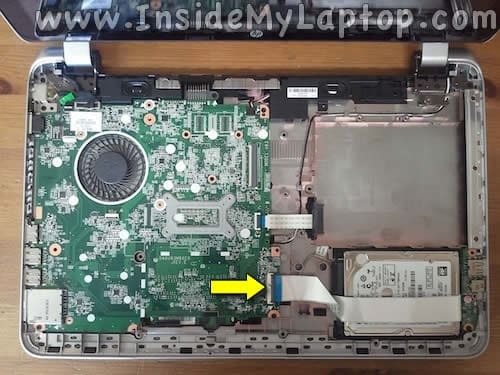 Pull the cable out of the connector (green arrow). 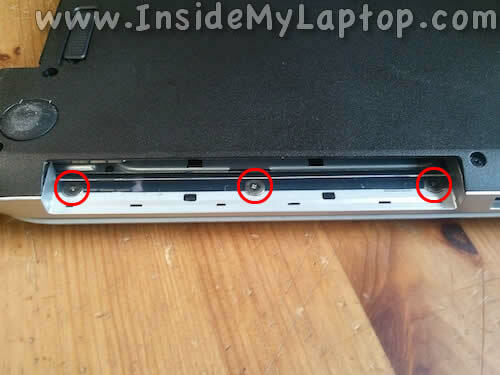 Remove three more screws from the optical drive bay. 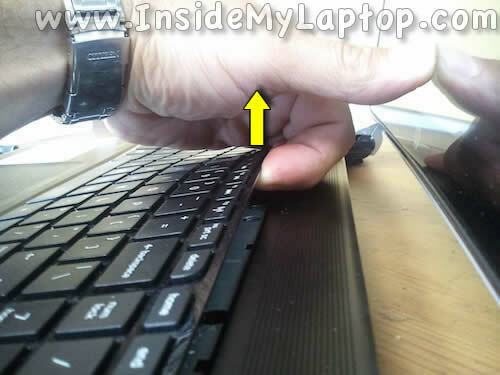 Disconnect the power button cable (yellow arrow) and touchpad cable (green arrow). 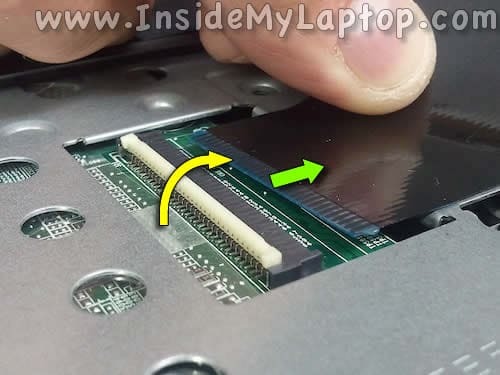 Here’s how to disconnect both cables. 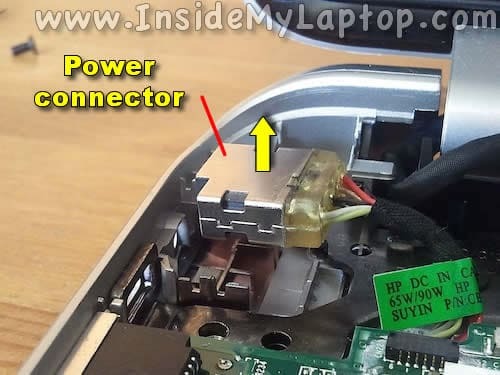 Unlock the connector and pull the cable out. 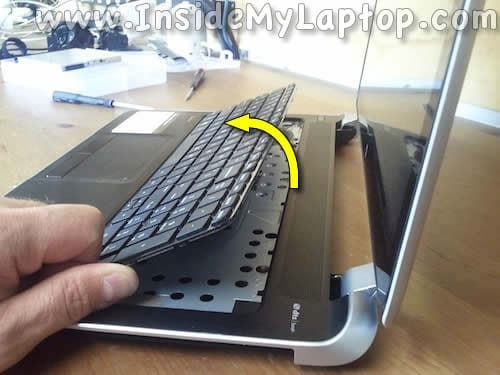 Start separating the top cover from the bottom case using a plastic stick or any other similar tool. Begin in the display hinge area. You can use a guitar pick to separate two parts. 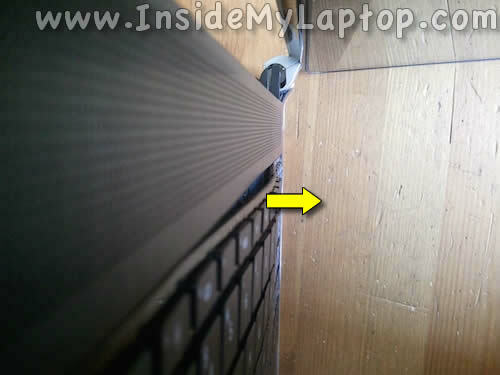 Insert it under the top cover and move slowly along the side to unlock hidden latches. 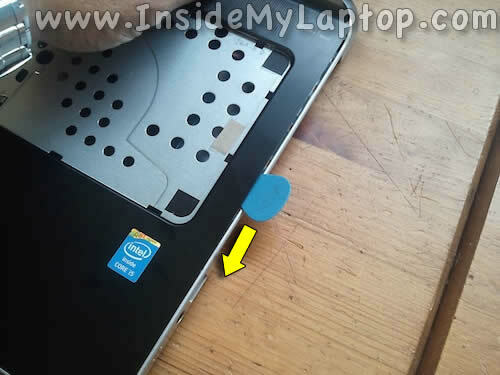 On the bottom side of the top cover you can access the power button board, touchpad and touchpad button board. 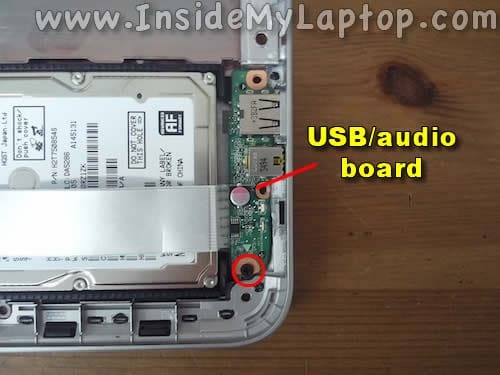 In order to access and remove the hard drive you’ll have to disconnect and remove the USB/audio board first. 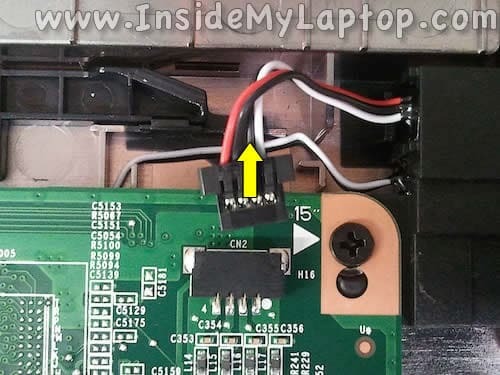 Disconnect the USB/audio board cable. Lift up and remove the board. 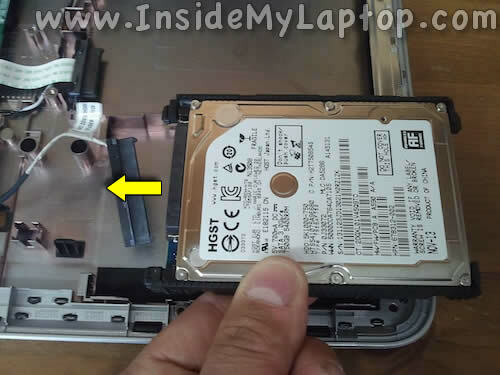 Lift up the hard drive from the case and disconnect the SATA cable. 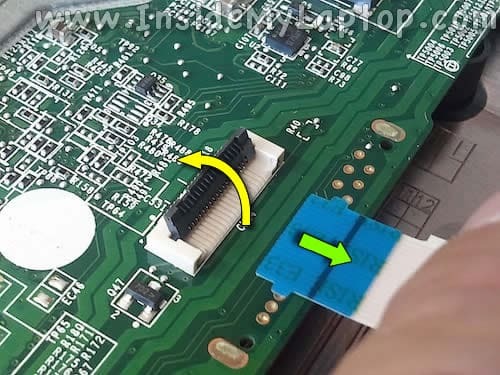 In order to remove the motherboard it’s necessary to disconnect and remove the wireless card first. 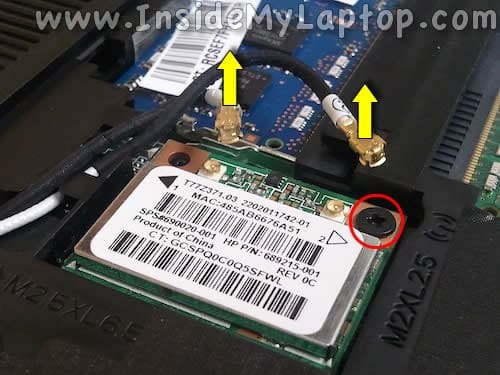 Unplug both antenna cables and remove one screw securing the card. 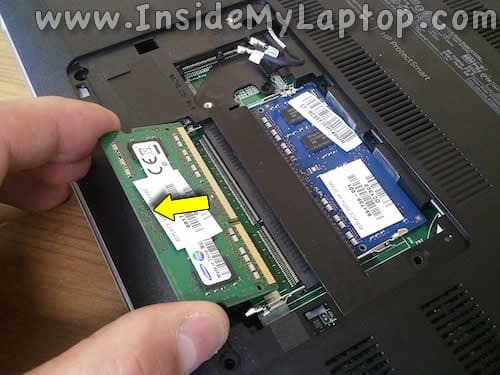 Also, it’s necessary to remove one of the RAM modules. 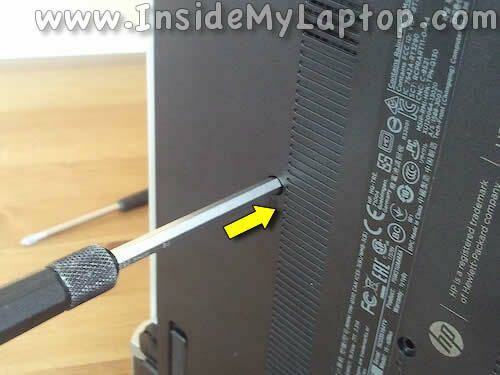 Unplug the display cable by lifting it up by the black tab on the top. Disconnect the webcam cable located on the left from the display connector. 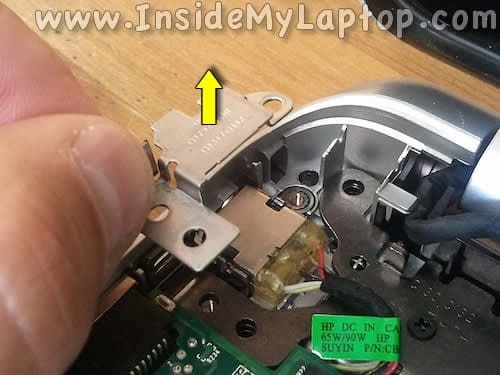 Unlock and disconnect the optical drive connector cable. 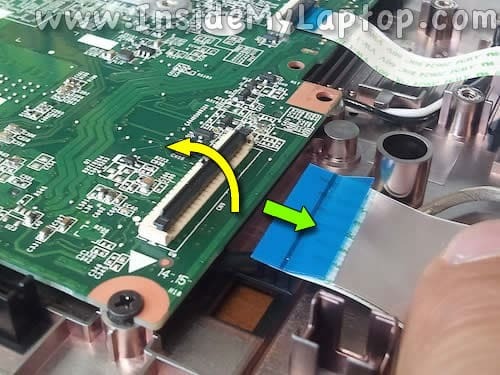 Remove two screws from the bracket securing the power connector (DC jack). Separate the power connector from the case and lift it up. 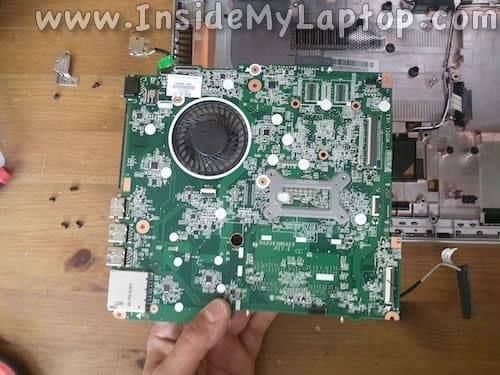 You can disconnect it completely only when the motherboard removed. 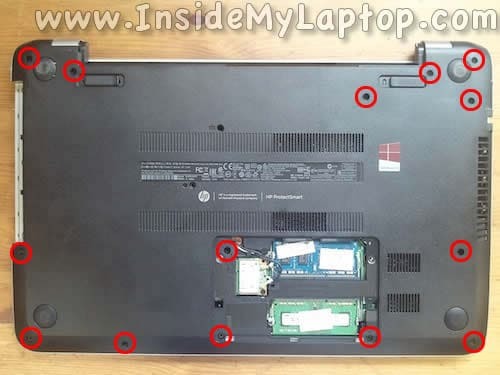 Start removing the motherboard on the right side as it shown on the following picture. Remove it from the case completaly. Now you can unplug the DC jack. Some days ago I needed to dissassemble my laptop and the official manual was not enough to guide me. 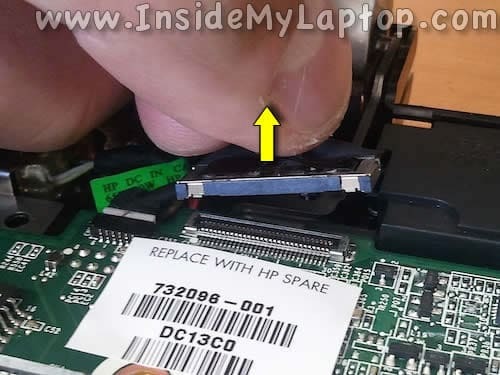 When I tried to assemble my lapto again, it didn’t turned on. Your site rescued me and helped me to connect all the wires. Now I am writing this comment from my laptop. An excellent guide. In fact these guides would help any interested person judging the build quality before buying or indeed recommending to others whether to buy. My main issue is ease of access to RAM, HDD and power inlet socket. Much better if the latter is NOT soldered to the mobo as in this model. I want to get to the hinges of this model as they are clicking/stiff. I may need to replace them. What dismantling methods are recommended? 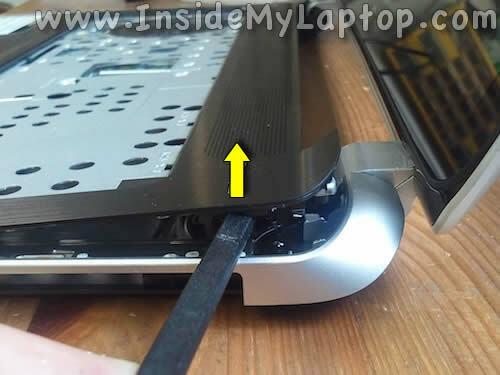 I am thinking I proceed to step 20 of this disassembly guide then can gain access to the hinges. Is that correct or is there more to repairing/replacing the hinges than I am thinking? Further guidance will be appreciated. Thanks. 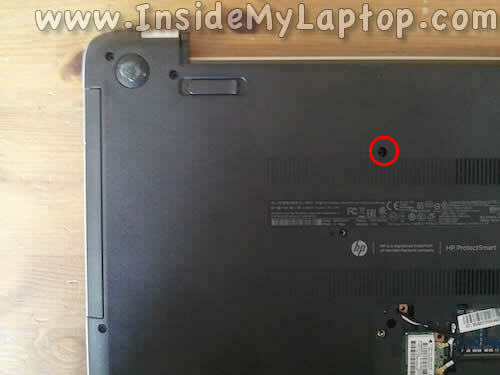 the red circle is shown around the keyboard screw. 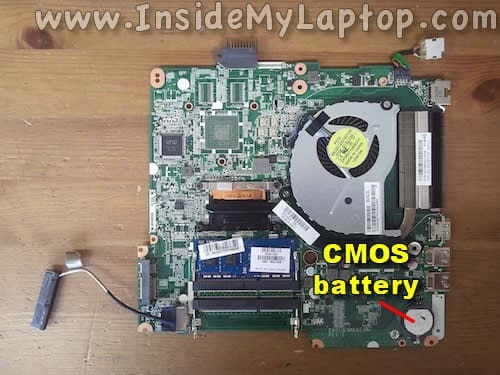 I want change cmos battery. ?If yes can me say me how? 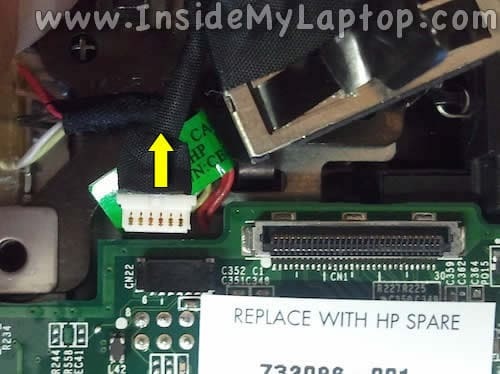 i recently disassembled my laptop hp 15 n series, but during reassembling process i was unable to fix keyboard in its adapter on motherboard, as a result the adapter on motherboard in which the keyboard strip gets fixed was completely removed from motherboard. So nw i have to replace the whole motherboard. 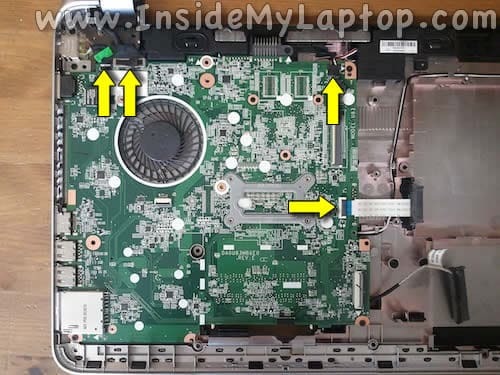 PLease tell me if there is some other solution without changing the motherboard. Is it Philips or JIS? And what size? 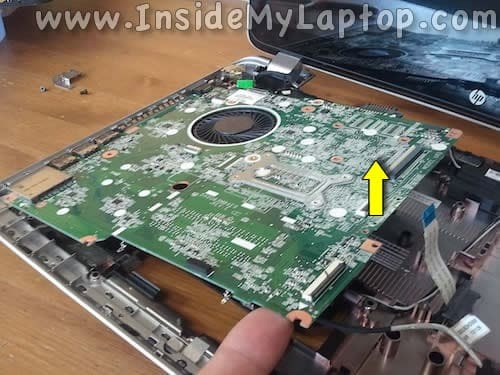 Very nice tutorial, have dis- and re-assembled the laptop twice already using it. 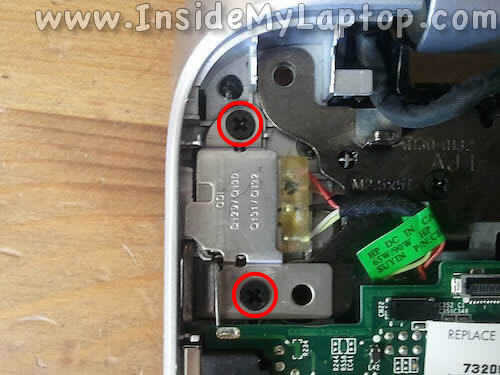 But after having done the first time (and since then) the power button has no working light in it (despite the connected ribbon), and the screen does not sense when it is closed, so always stays on. What might be causing this? Also: the whole reason I had to take it apart is because the cooling fan was rattling. 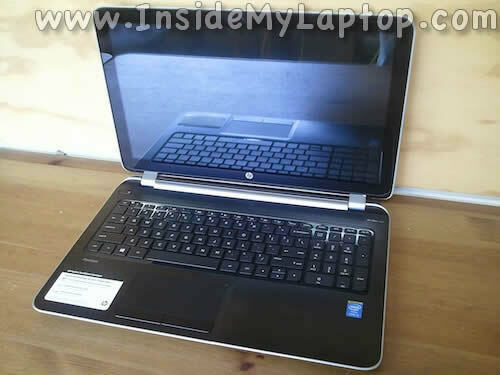 Now the new replacement is also giving off a faint rattle (at high RPM, or if the laptop is tilted). Does any one of you also have a problem like this? @Joe: for me, a 00x20mm Philips head worked fine. I’m having the sane problem as Teo. I’ve got a jewellers screwdriver and pliers to help me twist it but all I’m finding is some give in the screwdriver that shouldn’t be there, it’s a disaster! Thanks for all your good work. 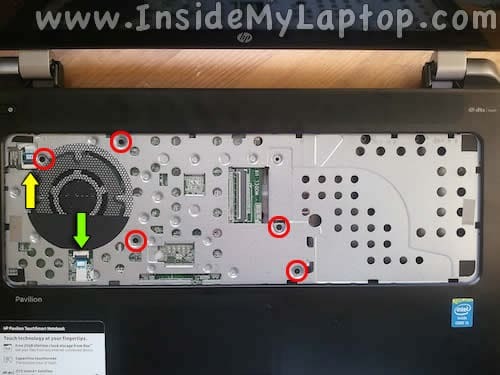 My HP15 laptop wont boot up bit it powers on cause when i press the power on button it displays a power light but goes off after some seconds…I don’t know what is actually wrong with it, or has it developed problems on the board? 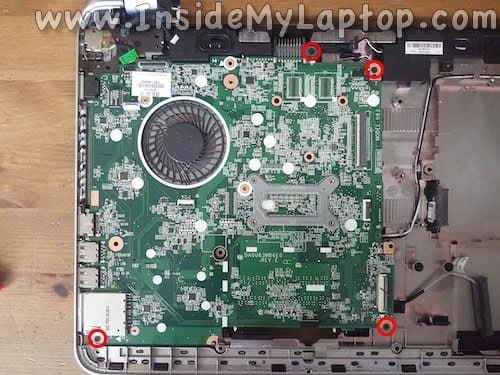 Please let me know as i need to fix this laptop as soon as possible. Thank you and God bless you.